At the end of the season, there always seem to be green tomatoes left clinging to the vine. Over the weekend I went to my mom’s house on the shore to help ‘batten down the hatches’ before the hurricane. During summer, she had the most bountiful tomato plants with the sweetest tomatoes. But with a massive storm surge on the way, it was time to salvage what we could, and say goodbye to the plants. So I came home with a pile of green tomatoes. I spent Sunday night cooking up a storm, in preparation for the hurricane. As it turned out, we were extremely lucky and never lost power, but I had baked bread, tossed pasta salad, and made meatloaf. And I began the great green-tomato-relish-experiment. 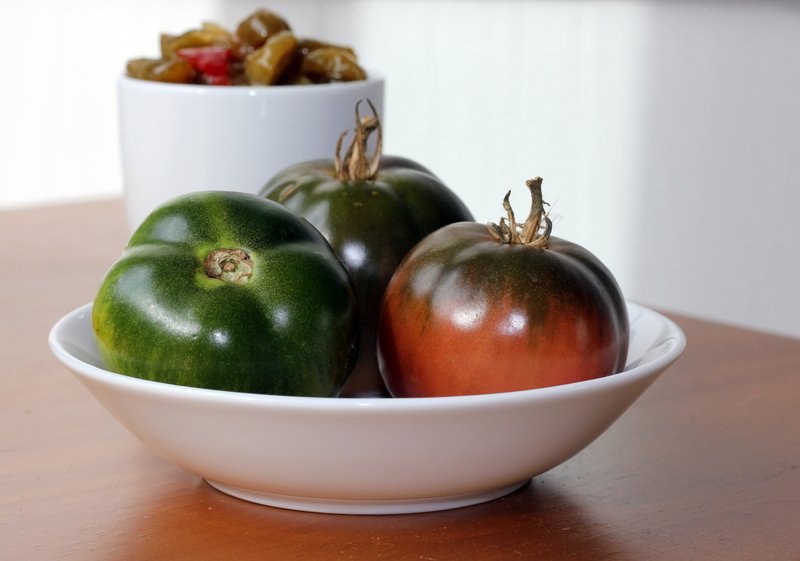 Not only had I never made green tomato relish, I had never even tasted green tomato relish. 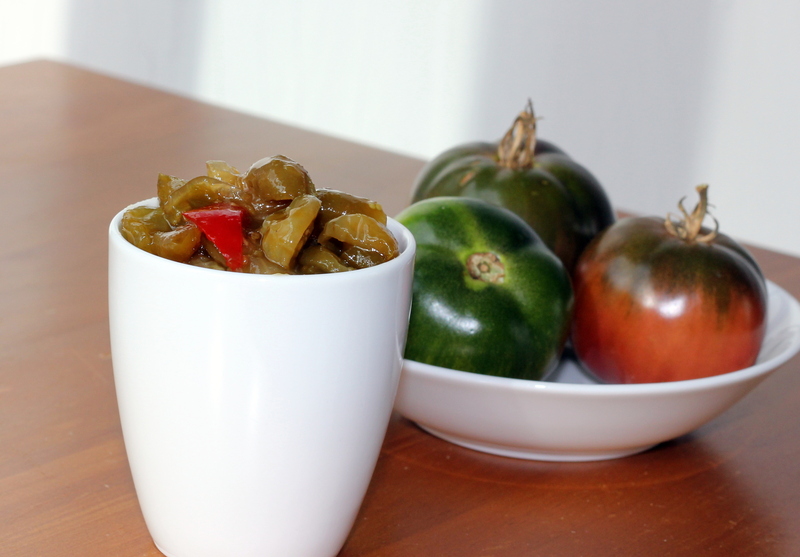 It turns out that green tomato relish is really easy to make, and also really tasty. However, after an evening of experimentation I determined that the type of vinegar is really key here. Although many recipes call for cider vinegar, I really liked my batch with white balsamic best. Of course, white balsamic is quite sweet, so you don’t need as much sugar as you might see in other green tomato relish recipes. This relish is tangy and sweet and wonderful on meatloaf. 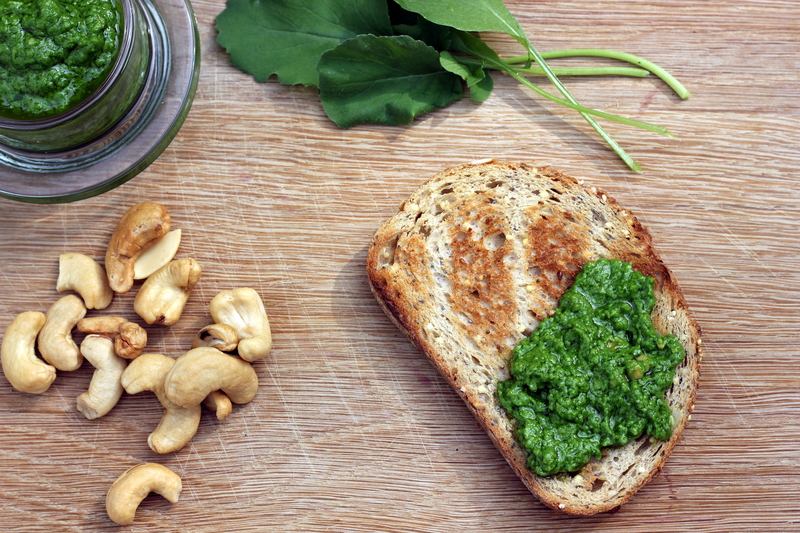 It also happens to be great on grilled cheese. And I spooned a bit over my scrambled eggs this morning, which was lovely. Of course, it would be great on a hamburger or hot dog too! I hope you all made it through the storm safe and sound! In a saucepan, saute the onion, pepper and garlic in oil over medium heat until the vegetables are soft, about 5 minutes. Add the tomatoes, the vinegar, the water and the sugar. Simmer gently over medium heat until most of the liquid has evaporated – about 20 minutes (plus or minus depending on your tomatoes). Add the salt and pepper to taste. Cool the relish and serve or store in the fridge for up to a week. Last weekend we were in Vermont for a dear friend’s wedding. In between a rehearsal dinner of sweet potato coconut pizza, the heart-warming marriage vows, and the after-party bonfire s’mores, Jeff and I managed to squeeze in a visit to the Rutland farmer’s market. A great farmer’s market is a treasure. And hitting a great farmer’s market on a great day in the middle of a great harvest, well, that’s just about as good as it gets. I’m very lucky that Jeff is ever-willing to help me haul my purchases home, because I couldn’t help myself. From beautiful pink radishes to tiny jars of picked garlic, to shimmering bottles of sweet icewine, I went a little overboard. 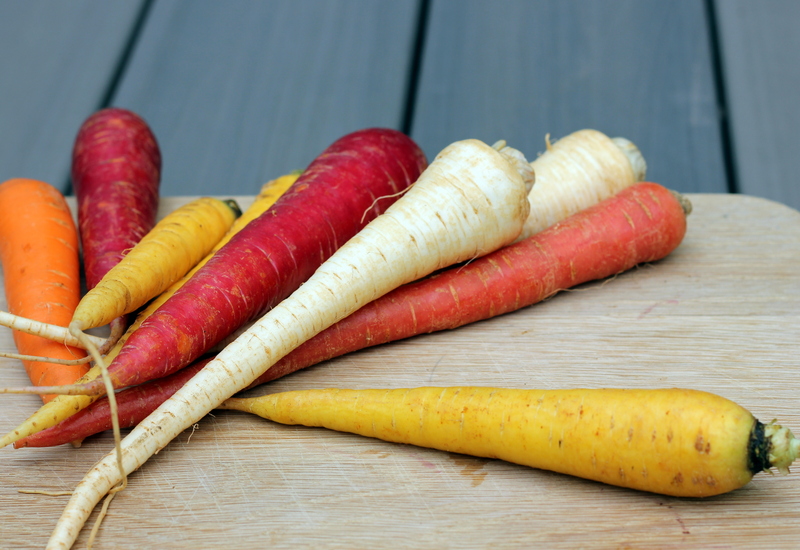 But the best purchase of the day was these beautiful multi-colored carrots. I adore roasted carrots. 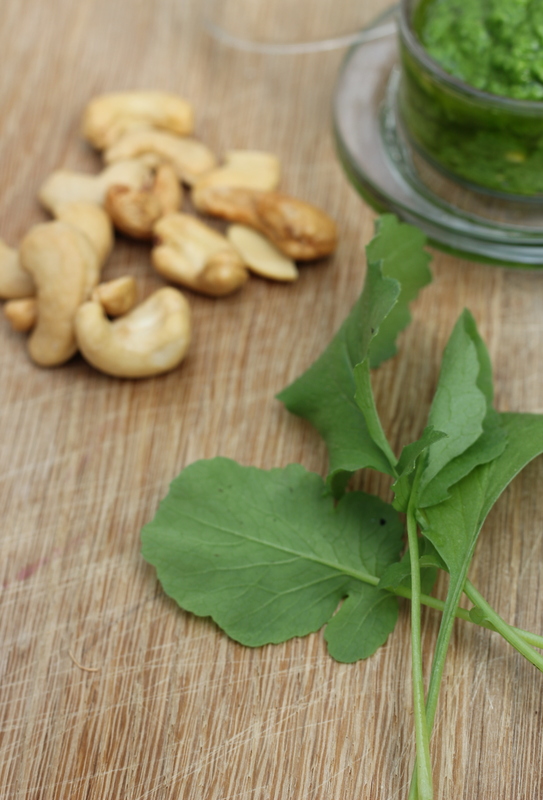 They are nutty and sweet, and when dusted with Aleppo pepper, just a bit smokey. The combination of sweet root vegetables and subtle Aleppo pepper is addictive. You can serve the Aleppo roasted carrots all by themselves as a great side dish. But the addition of green garbanzo beans and plump raisins takes this from side dish to meal. I have occasionally been able to find fresh garbanzo beans, but more often they are available frozen. And if you can’t find Aleppo pepper, you can substitute Spanish paprika to mimic the sweet and smokey flavor. Preheat the oven to 400 degrees. 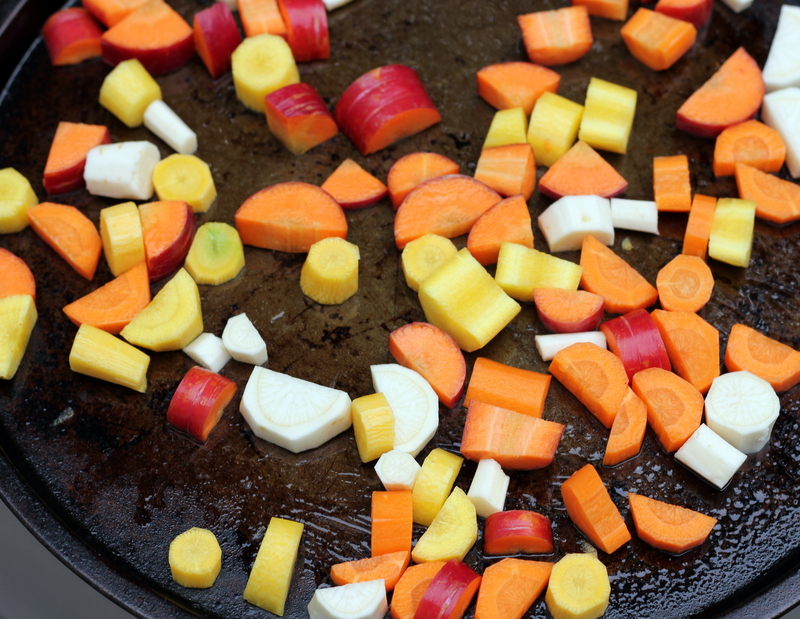 Toss the carrots with the oil, Aleppo pepper, and salt. 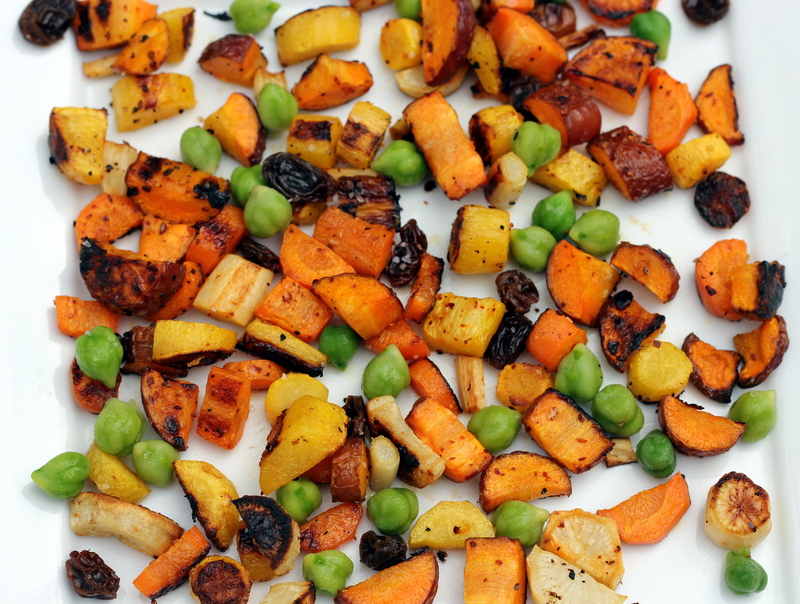 Spread the carrots on a baking sheet and roast until lightly browned at the edges, about 25 minutes. Meanwhile, microwave the garbanzos with a few tablespoons of water for 2 minutes, then drain. Simmer the raisins in the cider until they are very plum, about 5 minutes (you can also do this in the microwave if you prefer, just watch so it doesn’t boil over). To serve, toss the roasted carrots, garbanzos, and raisins together. Season to taste with additional salt and pepper if you like.